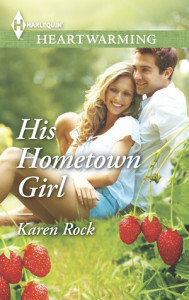 Today is my stop during the blog tour for His Hometown Girl by Karen Rock on tour with Prism Book Tours. I’ll be sharing my review with you today. I really liked Wish Me Tomorrow by Karen Rock, so I was really excited when I heard she was writing another book. Although I enjoyed Wish Me Tomorrow a bit more, this is another great book. The story is about Jodi and her autistic son Tyler, she moves temporarily back to her hometown and falls in love again with her childhood love Daniel. There also is some sort of battle going on for buying the farms, as Jodi is there for the company she works for, Midland, and Daniel tries to get farmers agree to join his co-op farm idea. I really enjoyed this book and I finished it in a few sitting. I especially loved the setting. I don’t remember ever visiting a farm and I really liked the farm setting in this book, it really brought that farm life alive. There where also some things I liked a little bit less, like how most of this book seemed more focussed on the battle for the farms than Jodi and Daniel’s growing relationship. Sometimes I just wished they would both open their eyes and see the others point of view and just stopped battling and talk with each other instead. While I liked Jodi and Daniel, I think I liked some of the side characters even more. Sue, Colton and even Daniel’s dad where great characters and there is a scene with Daniel’s dad that felt really touching for some reason. I would’ve liked getting to know more about Sue and Colton and I would’ve love to read a story from their point of view. Jodi is a great character, but I felt like sometimes she was being too rational and almost compulsive about her ideas, it was mentioned she was impulsive but I didn’t really see that in her. She just kept holding on to the ideas and plans she already made and didn’t allow herself to consider other options. Daniel in a sense was the same, while he tries to convince Jodi to stay, he never considered seeing things her way or consider moving with her. It seemed so many more options where open to both of them, but they didn’t even consider them or talk about them. Actually they didn’t talk that much about their relationship at all, until very late in the book and then they still don’t consider a lot of other options. Jodi and Daniel make a great couple and there where some aspects of their relationship that where done really well. At times I wished they talked a bit more, instead of battling and I wanted to read more scenes where I felt the romance, because it felt like there was very little time they had for each other or to go somewhere with just the two of them. I loved the scenes where Daniel spend time with Tyler and realized he cared about both Jodi and Tyler. There are some great scenes where I really felt the romance between Jodi and Daniel, like the scene with the cow and the scene with the strawberries. There is also this scene towards the end that really bugged me for some reason, both characters do something dumb. Then something really predictable happened and I just wanted to shake some sense into both characters. Then again the ending was great. Although I would’ve loved to see what would happen next and how their life would be. To conclude: I really enjoyed His Hometown Girl. I really liked the farm setting, but there where also some things that bugged me a bit. I thought the focus was a bit too much on the battle sometimes and too little on the romance. And I felt that Jodi and Daniel sometimes where a bit too close minded and didn’t try to see the other’s point of view. Also the story is a bit predictable at times. I really enjoyed the ending and there are some really sweet and touching scenes in this book. You can add His Hometown Girl to your to-read list on Goodreads. Karen Rock has adored romance since receiving Harlequin Presents books from her grandmother each summer. She formed her Young Adult writing partnership, J.K. Rock- pseudonym for the CAMP BOYFRIEND series, with her sister-in-law and Blaze author, Joanne Rock in 2011. When Karen heard of a call for submissions to Heartwarming, Harlequin’s latest line, she was inspired by the possibilities of writing unforgettable, deeply romantic, tender love stories that mothers would feel comfortable sharing with their daughters. When she’s not writing, Karen loves scouring estate sales for vintage books, cooking her grandmother’s family recipes, hiking the ‘high peaks’, and redesigning her gardens. She lives in the Adirondack Mountain region with her husband, daughter, and two Cavalier King cocker spaniels who have yet to understand the concept of “fetch” though they know a lot about love. For more information about Karen’s upcoming books, check out her website, Facebook page, or follow her on twitter. She’d love to hear from you! Nice review Lola, but I don’t think this is a book for me. Glad you enjoyed it. Thanks for stopping by Aurian :). It was a nice book, but I thought Wish Me Tomorrow by this author was better. I really enjoyed Wish Me Tomorrow, Karen Rock is a great author. His Hometown Girl was stil an enjoyable read too :), it has a great small town setting and I really liked the role the farms played. It just missed something for me that Wish Me Tomorrow did have.